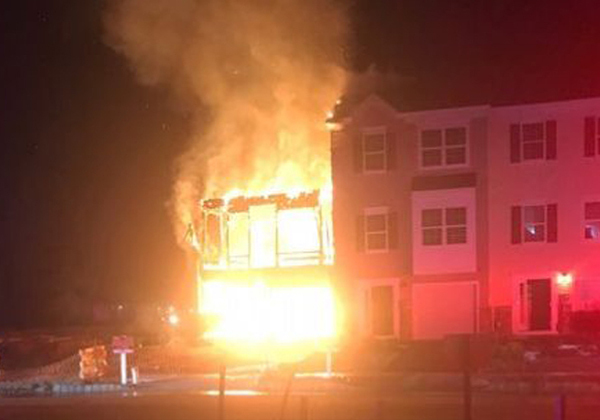 The bad news is we had another fire in a wood framed building under construction, reported around 2:50 a.m. yesterday that damaged three unoccupied townhomes at the Iron Gate development in Sicklerville. "A security guard reported flames coming from the rear of several homes at the complex on Iron Gate Road near Jarvis and Williamstown roads", said Gloucester Township police. Police previously reported at least three suspected arsons at Iron Gate between September and early January. None of the predawn fires caused any injuries. Firefighters from Gloucester Township, Pine Hill and Winslow responded to the Tuesday morning blaze, which is under investigation.Being that this building was pretty far along in the construction phase, it was contained unlike when they are just raw framing. The good news is the Risk Management Underwritters are starting to pay attention to our treatment. When we fire treat and protect 100% of the interior lumber instead of just exterior fire wall they are realizing they have less risk to insure and can considerably lower their high premiums. Building high density wood buildings premiums are similar to life insurance applications asking if you smoke or abuse alcohol which drive premiums up. In this crazy world as arsons continue to attack buildings under construction it's important for builders to defend themselves with every tool available. All US Builders can now hire M-Fire and our cost-effective Mighty Fire Breaker™ to follow and apply as they frame. Our clean fire inhibitor is UL GreenGuard Gold certified to be safe around children and in schools. Mighty Fire Breaker™ lowers your risk and may even get a premium reduction to cover the cost. Add big warning signs that tells the arson they are on camera and to not make this mistake that could land them in jail for life. Make sure all your fences are tall and secure. Make sure your buildings are always left clean with little wood scraps left inside.